« In Pictures: Ethiopian Airlines’ First Dreamliner Touch Down in D.C.
New York (TADIAS) – Ethiopian athletes at the 2012 Olympics received a hero’s welcome even before they left London when the Ethiopian embassy there hosted a gala dinner in their honor Monday night. Ethiopia earned seven medals, three of them gold, in athletics in London. The nation’s largest haul ever was in Sydney in 2000, where four out of a total of eight medals were gold; while in Beijing, four out of seven medals were gold. Ethiopia’s ambassor to the UK, Berhanu Kebede, praised the London team. The nation leads the continent and trails just the United States, Russia, Jamaica and the United Kingdom on the athletics medal table, in which the order of countries is based on number of golds followed by number of silvers and then bronzes. Kenya follows Ethiopia with two golds, though the country’s overall medal count in athletics, 11, is greater than its East African neighbor’s. Out of 33 countries that medaled in athletics, only those six took more than one gold, with the rest of the table consisting of those with just one title or only lesser medals. 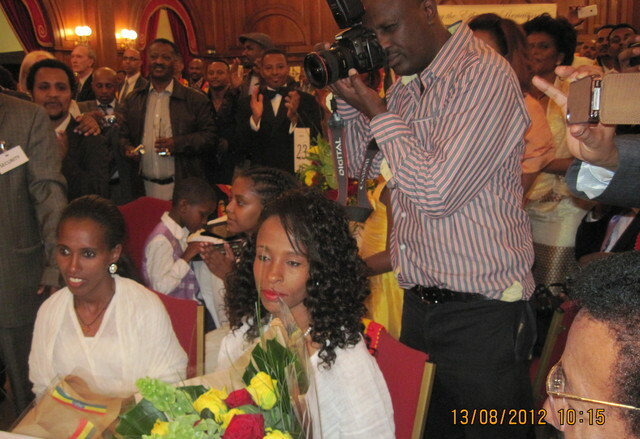 After a poet referred to the athletes as jewels and another speaker told them they had left Ethiopians abroad “awash in feelings of joy,” gold medalists Meseret Defar and Tirunesh Dibaba and silver medalist Dejen Gebremeskel briefly took to the stage and addressed the gathering at London’s Porchester Hall on Monday night. Wood paneling and red velvet drapes covered the walls and chandeliers hung from the ceiling in the room, which was filled to capacity by a 450-strong crowd decked out in traditional Ethiopian and formal wear. 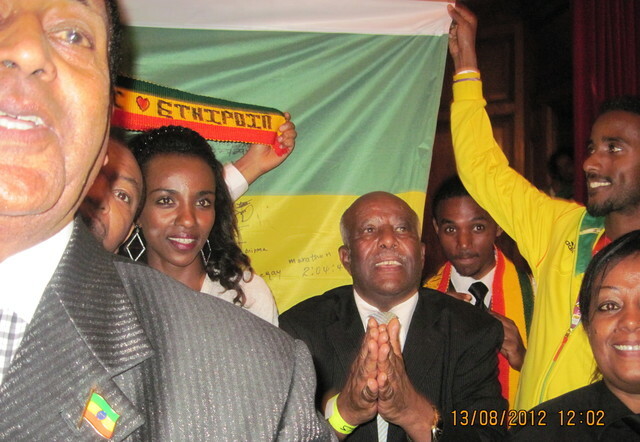 “You have contributed to our success,” the 5000m Olympic champion Defar told the gathering, citing the reception given to members of the Olympic delegation upon their arrival at Heathrow Airport among other displays of support London-based Ethiopians had provided. Defar went on to point out the greater success at the London Olympiad of Ethiopia’s female athletes. Five of the seven medals and all three golds were earned by women. Her comments received general cheers and applause and ululations from some women in the audience, and prompted London 5000m silver medalist Gebremeskel to draw laughter when he felt the need to begin his remarks by stating that he was not necessarily speaking on behalf of the male athletes, but rather the whole team. The London women’s 10,000m champion and 5000m bronze medalist Dibaba echoed Defar’s comments. The two women and former world cross country champion Werknesh Kidane were resplendent in traditional white Ethiopian dresses, while a wider array of national costumes was on display on members of the audience, a troupe that performed traditional dances, and models taking part in a fashion show of clothes inspired by traditional designs. The evening included many non-Ethiopian guests, some having some connection to Ethiopia, and a buffet dinner of Ethiopian and Western fare. The highlight for most in the room, however, was clearly the proximity to the star athletes, who untiringly obliged their requests for photographs and occasional autographs. She also expressed pride in the female athletes’ performance in London, where Tiki Gelana won the women’s marathon and Sofia Assefa took bronze in the women’s steeplechase. Abeba Aregawi and Dibaba’s sister Genzebe were top contenders in the women’s 1500, but while Aregawi finished outside the medals, Dibaba was injured during the qualifying rounds. Injury also kept Fantu Magiso out of the women’s 800. In many events, the competition is more fierce on the men’s side, while some countries’ cultures keep women out of sports. Ethiopian women have had the example of Tulu and 1996 Atlanta marathon champion Fatuma Roba to follow, augmented by the successes of Tirunesh Dibaba and Defar. Injuries affected the men’s results in London too, with Beijing double champion Kenenisa Bekele making his way back from injury-filled years and the year’s second-fastest 5000m runner in the world, Hagos Gebrhiwet, having been injured in the lead-up to London, while Athens Olympics fourth-placer Gebregziabher Gebremariam suffered an injury while in London before the 10,000m race. Bekele, who was fourth in that race, left London and headed back to Ethiopia a couple of days after it. His brother Tariku took bronze. Mohammed Aman was also widely expected to medal in the men’s 800. Meanwhile, an even younger athlete was taking in the proceedings at Porchester Hall with special appreciation. 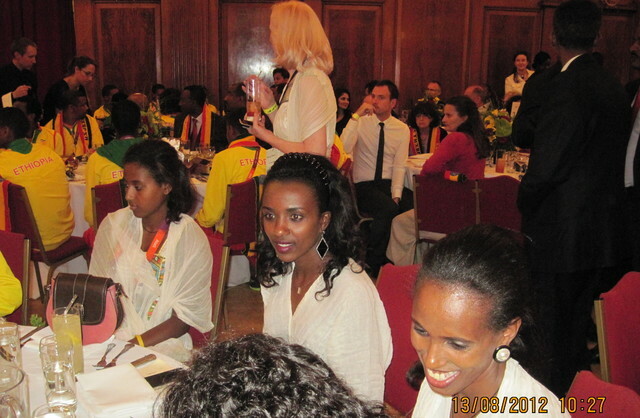 Ethiopia’s first ever female Olympic swimmer Yanet Seyoum Gebremedhin, 18, was seated next to Dibaba at the dinner. Her wish was granted when the athletics team arrived in London and Gebremedhin found herself staying on the same floor in the Olympic Village, and receiving words of encouragement from her and Defar and other team members. At the 2012 Olympics, Dibaba and Defar did make history. Tulu lost and then regained the 10,000 crown in 2000, but in London, the Beijing 2008 champion Dibaba became the first to successfully defend the title, while Defar became the only woman to win the 5000m twice, after she first won in Athens in 2004. “It’s very pleasing that at this critical competition, at the Olympics, the whole team has performed this well,” said Defar.